Basic foote soldier fighting with a 16′ Pike, formed “block’s” and then attacked the enemy pike blocks, either at charge for point to point fighting, or in a pike push, (which is similar to a large rugby scrum with 25-30 men on each side), the idea being to gain gound. 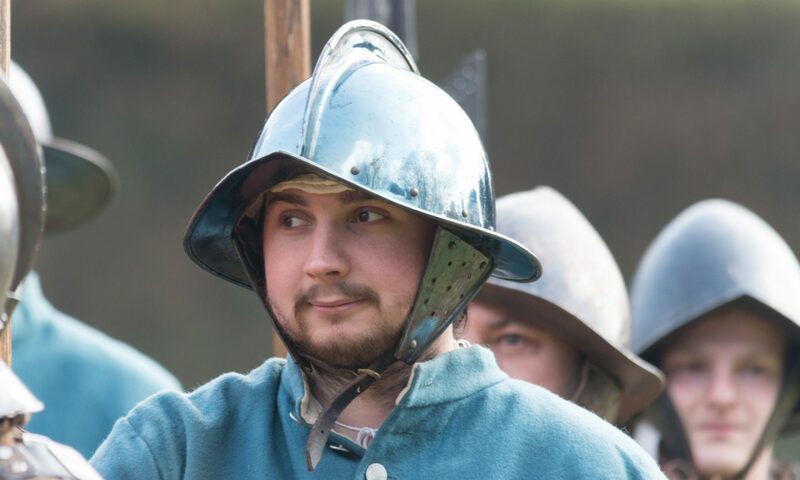 Pikemen are also used to protect the musket blocks from the enemy cavalry. The pike block forms the backbone of some regiments, it is a very rewarding role which demands full physical contact and a degree of stamina. However, don’t let this discourage you as training is given, and safety does play a very large part in it. You can always take a few minutes out of the fury of the battle to catch your breath. It is great fun with a lot of regimental pride involved, and the elation after winning a pike push is imense; you get rid of aIl that pent-up aggression, safely. The Pike of the any Regiment pride themselves on turning out a smart, well-drilled unit that can often be found in the front-line of the army.